Everyone lights up when they see Mickey Mouse! 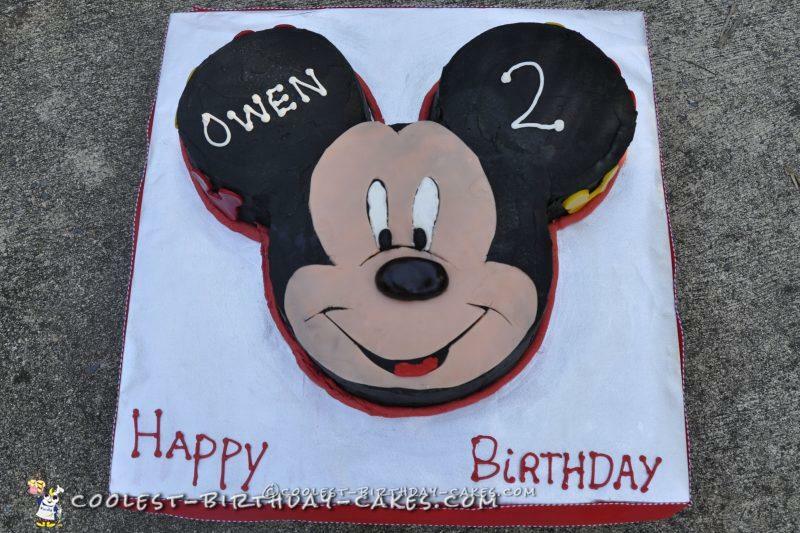 My two-year-old nephew is a big fan so he got a Happy Mickey Mouse cake for his birthday! It was fast and easy to make! I used an 8 in. round for the head and two 6 in. pans for his ears. 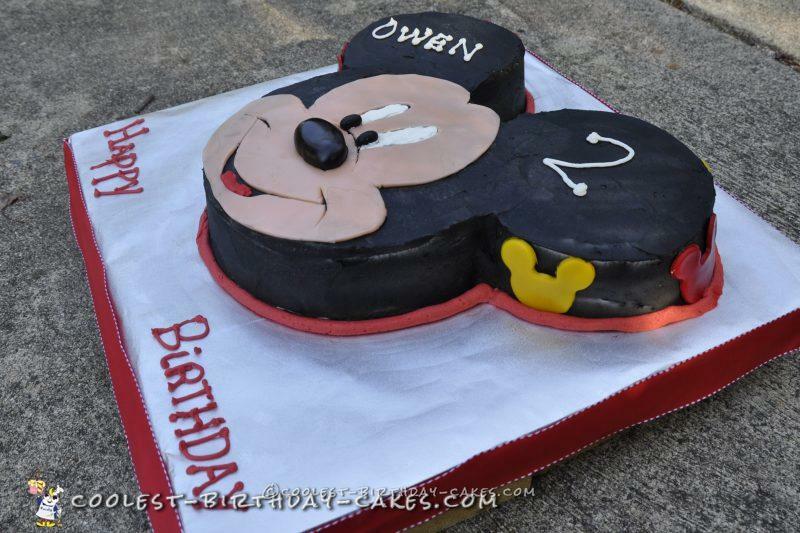 Mickey’s face was vanilla with buttercream layer and the ears were Devils Food Cake with a buttercream layer. I cut the ears to mold to the head then froze all the cakes. A couple of days later I frosted the Happy Mickey Mouse cake with homemade classic vanilla buttercream. After layering the cakes and covering with white buttercream, I airbrushed the entire cake black…. you could just use black colored buttercream too. Then I cut out flesh-colored Wilton Modeling Dough in the shape of Mickey’s face, I just made my own template on a sheet of paper. Then I added a puffy black modeling dough nose and 2 black jelly beans for his eyes. I then gave him a red tongue and added whites in the eyes and he was just about done. I had a small Mickey cookie cutter and cut some red and yellow modeling dough (or you can use fondant) and placed those around his ears only so as not to detract too much from his face. Then I wrote the birthday boy’s name and age on the ears! He was all smiles when he saw it and it tasted delicious! Birthday cake idea Posted by Megan H.